Poll: Which ore(s) do you think would be useful to have a meter for? As much as I enjoyed making this mod, I unfortunately wont be able to continue development on this mod. The continuation of this mod can be found here by MCWizard111. Diamond meter is a device that, when held in your quick-bar, will indicate if there is any diamond ore near to you. Cause lets just admit it, all of us have better things to do than strip mine the bottom layers of your world, looking for diamonds. This will be my first mod for Minecraft, so enjoy, be patient if you have any issues, and of course, leave comments about how you like it, improvement suggestions, bug reports, etc. SCMowns has made a tutorial on how to install Modloader and the diamond meter mod directly into your Minecraft, as well as a demonstration of him using it. While your at it, check out some of his other videos and tutorials, its a great place to start if you want to learn how to mod Minecraft. For this mod to work, you will need the corresponding version of minecraft, and the correct version of Forge installed first to work. To install, once you have installed Forge, simply copy the "DiamondMeter X.X.X.zip" file (replacing X.X.X with the version number) into the mods folder. On a windows machine, it is found at "%appdata%\.minecraft\mods\" (without quotes) by default. You can install these textures the same way as the mod, by either putting it into your mods folder (along with the Diamond Meter mod), or copy the files directly into the mod zip, overwriting the current textures. This texture pack has 64x64 textures, and may not work properly with texture packs that are lower quality than this. This texture pack has 32x32 textures, and may not work properly with texture packs that are lower quality than this. This texture pack has 16x16 textures, and should work properly with all texture packs. These texture packs have 64x64 and 128x128 textures, and may not work properly with texture packs that are lower quality than this (pack sizes are labelled). Some people are probably thinking "Diamond meter? That's cheap! ", but you actually need a few diamonds to construct it (11 total). This mod has a config file that can be modified to get different effects. It is located in your MineCraft folder (%appdata%\.minecraft by default), and is named DiamondMeter.txt. In this file, you will see a few settings, in the format <setting>=<value>. If at any point you wish to restore the default value for a setting, delete the line for that setting, save the config file, and restart the game (or "use" the Diamond Meter to reload the config). 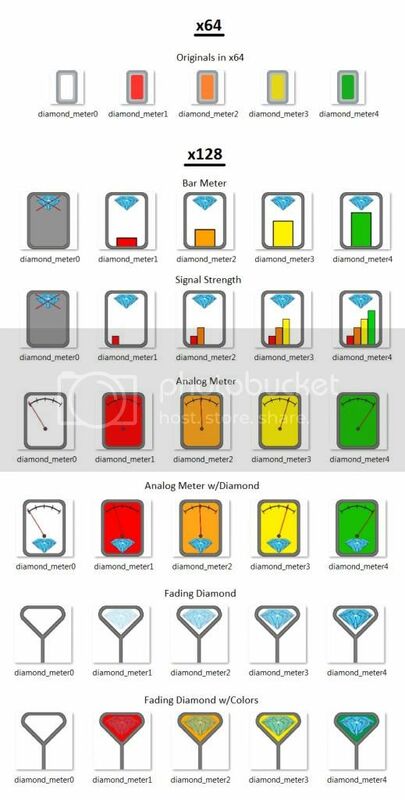 Please keep in mind that "Diamond Meter" was designed with the default values. The config was added to allow users to customize as they please. toFind (default 56): the block id to look for. distanceMax (default 8): changes the maximum distance to look for the block. Setting this too high may crash your game, so keep it within reason. playSound (default false): tells the Diamond Meter whether or not to play a sound every time it transitions. soundVolume (default 1.0): changes the volume level of the Diamond Meter (if enabled). Muhtorial has made a video in German that covers how to use the Diamond Meter, and also how to install it. Tormz has made a very nice showcase for this mod. x2robbie2x has made a useful review, showing usage of the diamond meter. drackiseries has a review on his channel showing the usefulness of the diamond meter. FeatheryNinja, showing the diamond meter in use. TrippyNinja posted another video, showing how this mod works in 3 dimensions. Plus, many more on Youtube, and in the comments! Try it out, it saves alot of time, it's worth the 11 diamonds. I tried to keep it at a level where you had to work to build it, but once its built, it doesn't completely make mining for diamonds a breeze. Any opinions is appreciated though! Diamond meter is a device that, when held in your quick-bar, will indicate if there is any diamond ore near to you. Cause lets just admit it, all of us have better things to do than strip mine the bottom 10 layers of your world, looking for diamonds. Just so you know, this has been done before. I know "Finder Compass" also does something similar. Not that you can't also have one that works a little bit differently or with a different cost etc. Again, just letting you know in case you didn't already. Ah, ok. Thanks for the heads up, that's good to know. Just by taking a quick look at it, I think Finder Compass is a bit different, in it actually has a compass needle for finding certain ore. I haven't tried it though, so I'm not too sure. A compass, to me, seemed a bit cheap and easy for finding diamond (which is actually what I was going to originally make, but decided on a non-directional distance meter). Regardless, I still hope people try this out, and enjoy it. Another interesting take on the perennial diamond detector And not a bad one, either. Good implementation for a first mod. I've made a showcase,put it in the OP if you want to. Thanks Tormz, very nice! I added it to my post. I had an idea. What if u made a machine that could make diamonds, but not overpoweredly. like this: machine would be 2 d blocks, 4 cobble 2 rs torches, and 1 iron on top. Then, u insert compressed coal into it (made with 9 coal) and in another box add rs. For every 1 compressed coal and 8 rs, u get 1 diamond. Just an idea. Can I include this mod in my modpack? I'll give you full credit. As long as due credit is given, feel free! Thanks for the video, can I put it in my post? Interesting idea, the thought had crossed my mind at one point. I'll look into that! as far as i know, there's a divining rod from EE2 which measure the EMC of the ores. but this mod is nice because it only detects diamond. The inside lingo had me at hello and we go where the money goes. This is an awesome mod! The diamond meter isin't to expensive and works awesomely! Made my house out of diamond using this. Thanks for the spotlight! I'll throw this in the post later. I have made some alternate textures for the meter, you can use them in the post if you want to, When i used the mod i found that it felt un-minecrafty holding a weird computer like object in my hand so I made some alternative textures, going with a scepter feel. Nice work, I'll give this a try later, and put a custom texture version with this in my post. Awesome mod! Doesn't really ruin the feeling of Minecraft! I made a review and Tutorial for your mod!